Area students receive DAR Awards - Times Publishing Newspapers, Inc.
Alaina Tarallo, a Yardley resident and senior at Pennsbury High School, received the DAR Good Citizens Award. Recommendation letters touted her excellent academic record and involvement in extracurricular activities, which include membership in three honor societies, active participation in the Pennsbury Mini-THON that raises money for pediatric cancer research, and longtime membership in Girl Scouts, where she has received the Bronze, Silver and Gold Awards. Anthony Cappetta, also of Yardley and a senior at Notre Dame High School in Lawrenceville, NJ, received the DAR Community Service Award. He was recognized for his Eagle Scout project that created a memorial at the Veterans of Foreign Wars Post 6393 at 1444 Yardley-Newtown Road. Brothers Grant and Kenneth Thorburn, of Newtown, each received the DAR Historic Preservation Recognition Award for their correlative Eagle Scout projects that resulted in a significant restoration project at the Historic Newtown Presbyterian Church cemetery on Sycamore Street in Newtown. Grant, currently a senior at the University of Miami, reset 50 old headstones at the historic cemetery while Kenneth, now a sophomore at the University of Delaware, continued his brother’s work by creating and erecting a permanent directory of grave locations throughout the cemetery. The Washington Crossing Chapter actively seeks to recognize outstanding students from public and private high schools in the Council Rock, Pennsbury, Morrisville Borough, Bristol Borough, Bristol Township, Bensalem Township and Neshaminy school districts. In addition to giving awards, the DAR also offers scholarships and classroom grants. High school guidance counselors may obtain more information by contacting the Washington Crossing Chapter via e-mail at washingtoncrossingchapterdar@gmail.com. For more information about the DAR or the Washington Crossing Chapter, visit www.dar.org or www.washingtoncrossingdar.org. 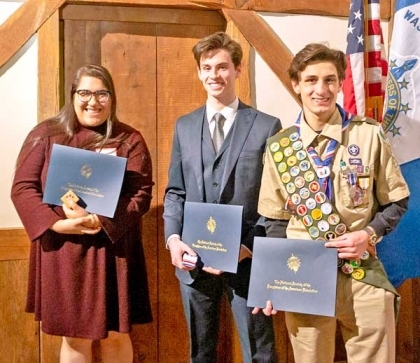 PHOTO CAP: From left, Alaina Tarallo, Kenneth Thorburn and Anthony Cappetta received the DAR Good Citizens, Historic Preservation Recognition and Community Service Awards, respectively, at the Washington Crossing Chapter DAR Youth Awards Ceremony held on March 9th.